Alchemy in the Kitchen: Cider and Cinnamon Crêpes - Time to practice your pancake-flipping skills! Cider and Cinnamon Crêpes - Time to practice your pancake-flipping skills! Pancake Day nearly slid by unnoticed in the shadow of the fast-approaching Valentine’s Day chocolate fest. Eeek! I like my pancake accompaniments fairly simple - a drizzle of honey, a squeeze of lemon – so I’ve put the flavour in the batter by adding cider, vanilla and cinnamon. The kitchen smells like a Yankee Candle store while these are cooking. 1 In a mixing bowl, combine the flour, salt and ground cinnamon. Make a well in the centre of the flour and add the eggs. Whisk the eggs, gradually incorporating the flour from the edges. When the eggs are combined with the flour, gradually whisk in the milk, followed by the cider (or apple juice), sunflower oil and vanilla extract continuing to whisk until you have a smooth batter. This can rest in the fridge until you are ready to cook. 2 When you are ready to make the pancakes, heat a non-stick over a medium-high heat. When the pan is hot, rub it with piece of kitchen paper dipped in oil. 3 Pour approximately 60-70mls of batter into the pan to form a pancake approximately 8 – 10cm in diameter. As the batter hits the hot surface, tilt the pan slightly in a circular motion so that the batter spreads out evenly. 5 Serve immediately with wedges of lemon and sugar or honey. It's my first day back working in a school today and thought for sure that there would be pancakes, I have been thoroughly disapointed. Yours look delicious and I am incredibly jealous of them! I made batter last night so I can have them at lunch but I think I will have to add the cinnamon and vanilla in when I get home. Yummy!!! Och, just seen this after making a batch for the kids' breakfast. Will have to make more - I love the addition of cider and cinnamon, Hester. Have a super Pancake Day! Hester, you made crêpes for "Pancake Day" (Shrove Tuesday) - what a fun and pretty post! And it truly is the last day before Lent - we all like to indulge a bit in the days around the Carnival season. Your recipe sounds truly delightful - I really like that you added cider, vanilla and cinnamon to the batter itself, sounds like a recipe I really would like to try soon. Have a great "Pancake Day"/"Veilchendienstag"(Violet Tuesday as we call itaround here)! @ Andrea - Violet Tuesday, what a great name! I like testing new crepe recipes and I am going to try this in one hour after I pick up my son! My kids LOVE crepes... it's possible they would eat too much that they won't eat dinner tonight. 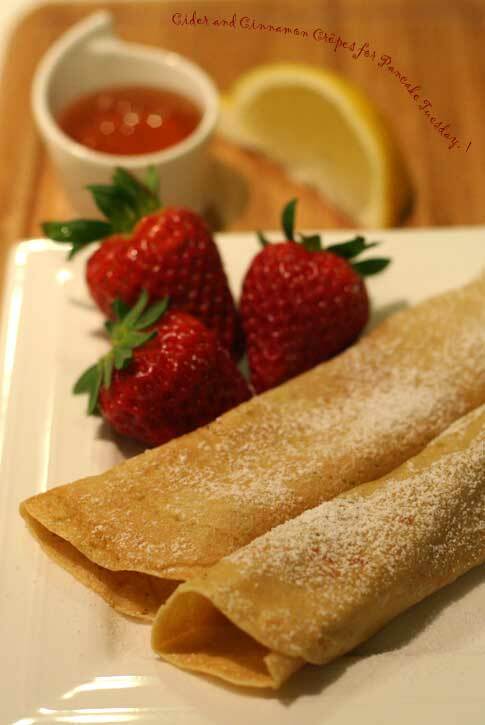 But Nutella and crepe sounds really tempting at this moment looking at your perfect crepe! Good timing! All-in-one Pita Bread – best supporting actor !